The engine is completely application-engineered to power motor graders which require fast torque response to keep high productivity levels. For even higher performances the Dual Power maximizes operation at higher speed thanks to the power curve flattening from 4th gear. Daily maintenance operations have never been so undemanding: all the main check points, on the left hand side of the machine, are easily reachable from ground level. The tandem mudguards are conceived to be the most functional and safer places to fulfi l periodical maintenance operations like the air filter cleaning or the oil refill. The smallest aftertreatment package in the market doesn’t impact the engine layout sharpness: the emergency maintenance operations will then be faster and less expensive. The automatic shifting function eases the operator concentration and optimizes the machine performances letting the grader engine work on the most productive area of the power curve. The function combined with the torque converter never reaches the power unit stall, making the real difference from competitors in the grader sector. 100% automatic diff. Lock: the automatic «no-Spin» differential instantaneously transfers the torque from the slipping tyre to the wheel with better grip. The system doesn’t require any driver intervention allowing the operator to be focused on the blade movement control. 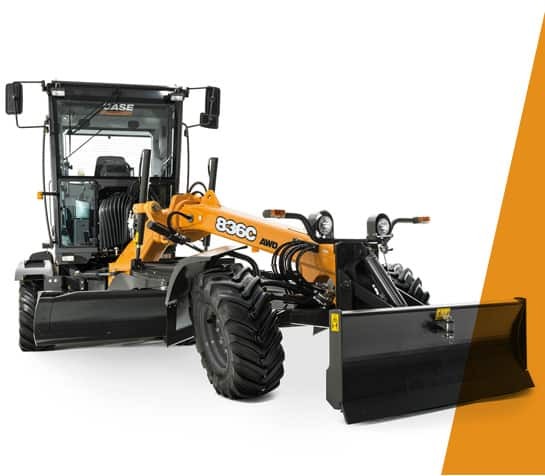 Creep mode on AWD models: 2 machines in one, the hydrostatic creep mode makes the front speed virtually independent from the engine revolutions: therefore the grader can be used in compaction application reducing the overall fleet deployed in road construction. Independently from the transmission chosen, 4 WD or 6WD, the 836C can be also equipped with 24’’ tyres: the ideal solution on uneven soils and when a low tyre bumping effect is required. Moldboard design revolutionizes and maximizes controllability: very low friction developed during operation, jolt-free high rotation torque for a very smooth and accurate blade rotation and steadiness. The slewing ring is mounted on roller bearings activated by internal gearing avoiding backlash, wear and supporting high mechanical strain. The exclusive moldboard design, with fewer greasing points, reduces the daily maintenance drastically. During the machine service life, periodical substitution of wear inserts is not required cutting down overall maintenance costs. The “A-Shape” structure constantly compensates the efforts while working. The tipical lateral stress on off-set position are virtually elimates for longer operating life. The saddle can be hydraulically set on 5 different positions very easily thanks to a pin lock system; the exclusive moldboard geometry enables the operator to rotate the blade over 90° for each working side without any mechanical interference. The infinitely variable radius blade reduces the traction effort, and in finishing operations improves the material mixing effect. The new CASE graders have the most precise hydraulic circuit in the market. With highly responsive and precise controls, the load sensing hydraulics make any operation easy and smooth. A directly activated axial piston pump delivers only the required amount of oil where it is needed, avoiding any power waste. The Control valves provide pressure compensation enabling the moldboard to be lifted or lowered in parallel. A dedicated switch installed on the cab floor allows the operator to obtain maximum output from the hydraulic circuit, independently from the engine revolutions, for faster reactions (Full Flow mode). The exclusive hydraulic block, directly controlled, reduces any lever free play over the entire grader life, meanwhile the operator can benefi t from a direct feed-back of the hydraulic system increasing the working accuracy. The float function, available as an option, lets the oil flow unobstructedly in the cylinders so to let the moldboard naturally follow the ground contour. Independently from CASE certifi ed high quality components, this exclusive hydraulic system has been conceived to ensure always unbeatable performances, fuel saving, reliability and grader controllability. The CASE “800 series” grader can be equipped from factory with the most common blade control installation set up. The unit is delivered to the customer with all the sensors, cables and supports. It’s a real “plug and play” solution: the customer has just to install the antenna and the monitor on the cab and the blade control is ready to work.The system is compatible with different types of controls: Sonic, Laser, GPS or Universal Total Station. The automatic blade control allows even the less skilled operator to get a considerable working capacity from CASE grader, this helps to get the job done faster meaning fewer rounds and always the right amount of material moved. Consequently, grader cost effectiveness in terms of operation and working time. With CASE control set up each customer can even use blade control devices already installed in other construction units of its fleet making the return on investment more immediate. The installation of main components in factory provides an easier accessibility and consequently faster maintenance service: this is a guarantee of high manufacturing standard, almost impossible to achieve through aftermarket solutions. The new rear view camera guarantees a safer rear visibility and an excellent operator comfort. The driver doesn’t have to turn back anymore when he has to drive the machine backward. Any obstacle can be easily recognized from a quick look at the wide 7” color screen. Finally, CASE offers an elegant low profi le cab on its graders providing best-in class comfort and visibility while reducing the machine’s total height of 180mm, so that there are no transport limitations. See how your favorite CASE Graders compare. Download CASE Graders brochure now!